Before getting his gears checked in order to helm Fast & Furious 7 (and also that Aquaman movie he’s just been announced for), director James Wan was previously known for his line of horror films including the first Saw film, The Conjuring and today’s topic, the Insidious movies. The first film, a low-budget twist on the overloaded supernatural sub-genre, was decent enough with its imagination despite some lame scares at times; the second, however, was as pointless and unnecessary an epilogue to a first film as you can get, and that’s before we get to a Shining rip-off during its climax. Though directing Vin Diesel and co driving cars out of a plane drew him away from directing this time round (though he does pop up in a brief cameo near the beginning), Insidious: Chapter 3 – now directed by series writer Leigh Whannell – is just as unnecessary as the first film, but is still far more enjoyable than one might expect. By having things take place a few years before the events of the first film (so really, the title should actually be Insidious: Chapter 0.5), Whannell allows a bit of room for new possibilities with the series’ long-standing characters. Most notable out of these is Lyn Shaye as psychic Elise Rainier, who gets far more screen time than any previous film and even has her own emotional arc, in doing so reminds those who watched the first two why she was the most memorable character. Shaye’s presence is a lot of fun, and though her character goes through one or two familiar beats in her own personal journey it’s enjoyable enough to watch. We even see the humble origins of comic relief characters Specs and Tucker (played by Whannell and Angus Sampson respectively), the look of the latter bound to raise a few chuckles from fans of the series. On that subject, the fact that this movie seems to be seriously geared towards audiences who had seen the previous two – with a few nods to the original here and there – may put some people off if they go in without knowing what to expect, and in some respects that can be a problem for newcomers. Even then, it’s a decent enough movie to stand fine on its own; by focusing on a new family this time round lifts the weight off the last one we focused on for two movies in a row, giving it the sense of an anthological piece more than a sequel/prequel. In all honesty, the family this time round has much more of a personality than the other one which, let’s be honest here, was never than interesting to begin with – Stefanie Scott’s teenage Quinn, for instance, has far more instant charm than Rose Byrne or Patrick Wilson did in those movies, and that’s not down to bad acting or anything but rather just boring characters. On that front, it’s definitely a step up. Other than that, it’s business as usual in terms of its scares and ideas. The Further – which, for those unfamiliar with the series, is the other-worldly realm where spirits of old roam about in the creepy darkness, which makes you wonder how they get about without constantly bumping into each other – doesn’t offer anything particularly ground-breaking or innovative this time round. We don’t learn that much more about it, how it operates or how it connects to the real world et cetera, and it doesn’t have that out-there vibe that Wan was able to successfully bring previously. That being said, there are a few notable moments of creativity on display; the demonic spirit known as The Man Who Can’t Breathe is a creepy design, and the connections this film does make to its predecessor are done in a way that doesn’t entirely alienate newer audiences. It’s not perfect, as it does tend to borrow a substantial amount from other horror films – though not as much as Chapter 2 did, especially in its Shining-ripping climax – as well as rely a little too heavily on the occasional jump-scare which can be spotted by viewers many moments before the actual characters do. 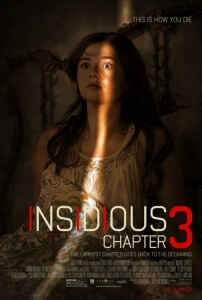 But for the most part, Insidious: Chapter 3 is a better-than-expected threequel which manages to satisfy fans of the first two movies as well as entertain newer audiences. Just make sure that the next film actually warrants the 4 in the title; we don’t need an Insidious: Chapter 0.75 on our hands just yet. 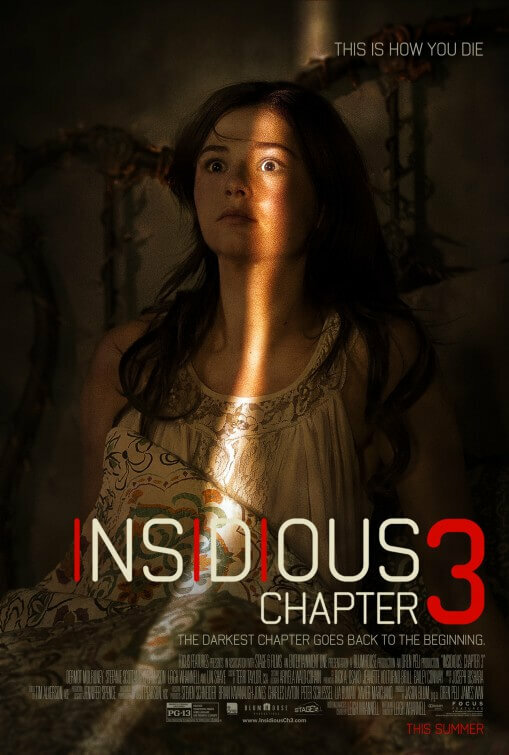 Insidious: Chapter 3 is a decent third film in the horror franchise, which though not perfect or completely original benefits from added Lin Shaye as Elise Rainier and a few moments of creativity that make the viewing experience worthwhile.